I feel bad doing these drive-by posts where I slap up a few photos and scurry back to what I’ve been doing, but I am exceedingly busy with work, getting ready for my trip, sorting out a mess with my student loans, and figuring out where I’m going to live once this lease ends. I guess the good thing is that the prevalence of anxiety and insomnia lately results in lots of knitting. 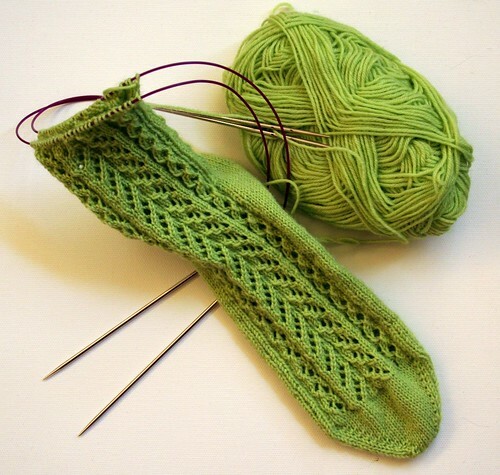 While I sort out what to do with my Eleanor socks (I am going to knit a third one to match the more open eyelets of the second sock, I think), I have continued working on my self-designed socks. Look – they’re actually looking like socks! I’ve decided to name these Springtide socks. In designing them, I was going for something that evoked the new life of spring growth, delicate chutes emerging from the soggy ground and vibrant leaf tips glowing in the sunlight. 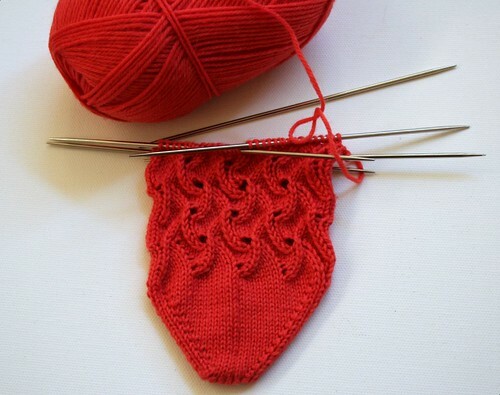 I hope to have these finished soon, as the deadline for their particular Sockdown contest is rapidly approaching. I also cast on a really cool pattern for July, Scrolls Socks (Ravelry link) by Charlene Schurch from her book More Sensational Knitted Socks. 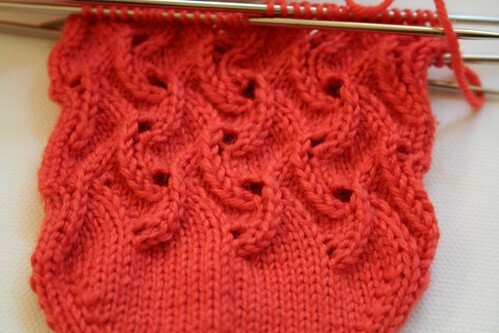 I love the swooping movement in this pattern, which is deceptively easy to knit. It’s amazing to me how such different patterns can emerge from simple combinations of knit, purl, increases, decreases, and YOs. I am utterly charmed by these. I’m planning to bring the Scrolls socks and a few other small projects with me to work on in Italy. 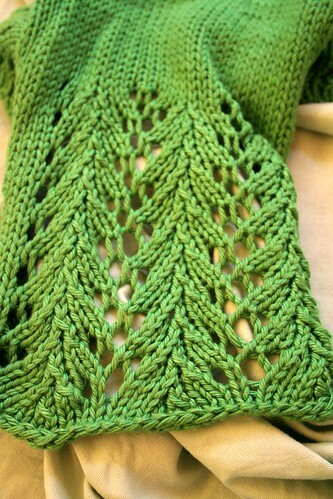 I am also planning to bring my newly-finished Jellyfish shrug (which we will talk about in all kinds of depth soon). Yeah, I’m pretty happy about that.